American folk-rock singer Bob Dylan has been awarded an honorary degree by Scotland's oldest university. 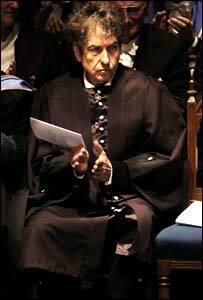 The University of St Andrews made Bob Dylan a Doctor of Music at this year's summer graduation ceremony on Wednesday. 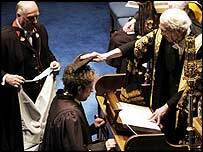 Dylan has only ever accepted one other honorary degree - from Princeton University in 1970. A garden party which was planned for after the event had to be held in doors because of the bad weather. University principal, Dr Brian Lang, described Dylan as an "iconic figure for the 20th Century". Mr Lang added: "His songs, and in particular his lyrics, are still part of our consciousness. "We are very pleased to take this opportunity of honouring such a major artist." The St Salvator's Chapel Choir performed its version of the Dylan classic, Blowin' in the Wind, before he stepped up to receive his degree. The singer-songwriter knelt on the stage before the university's chancellor, Sir Kenneth Dover, who performed the ceremony in Latin. Dylan was tapped on the head with the university's graduation cap, a late 17th Century doctor's birretum, which is thought to have been in use for the last 300 years. He turned and bowed after receiving his degree, to cheers and applause from the audience. Professor Neil Corcoran of the university's school of English said he was "deeply honoured" that Dylan had accepted the university's invitation. "For many of us Bob Dylan has been an extension of our consciousness and part of our growing up," he said. After the ceremony 23-year-old Jennifer Laurens, a graduate in social anthropology, said: "This is a very special day for St Andrews. "Considering that this is Bob Dylan's second degree and that he had agreed to travel to Scotland, it makes it an achievement for us all." Some Dylan fans were able to secure tickets for the event, while others waited outside in the rain in the hope of catching a glimpse of the star. However, he left through a side door after the ceremony. Best known for classic hits such as Like a Rolling Stone and Mr Tambourine Man, the singer-songwriter is credited as being one of the most influential artists of the 20th century. Fusing rock, country, folk and blues, Dylan's unique sound and political lyrical content made him a poetic spokesman for the 1960s generation. He remains as much an influence amongst current rock musicians as he was to the Beatles and the Stones in the sixties. The singer is currently on tour in Europe and, after receiving his honorary degree, will play the first of two nights in Glasgow. Bob Dylan: What is his legacy to music?